Autumn is my most favorite time of year. The cool weather, the beautiful colors and that desire to curl up with some eerie books and creepy movies. 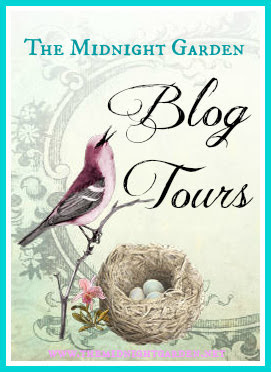 Today is my exciting tour stop on the Halloween Trills & Chills event hosted by The Midnight Garden and I’m featuring a guest post from Jonathan Stroud where he shares his favorite horror films. Having just read The Screaming Staircase and being currently in the middle of The Whispering Skull, I completely trust his opinion on anything creepy. His series is a fantastically fun mix of mystery and creepy that you won’t want to miss the chance to enjoy. 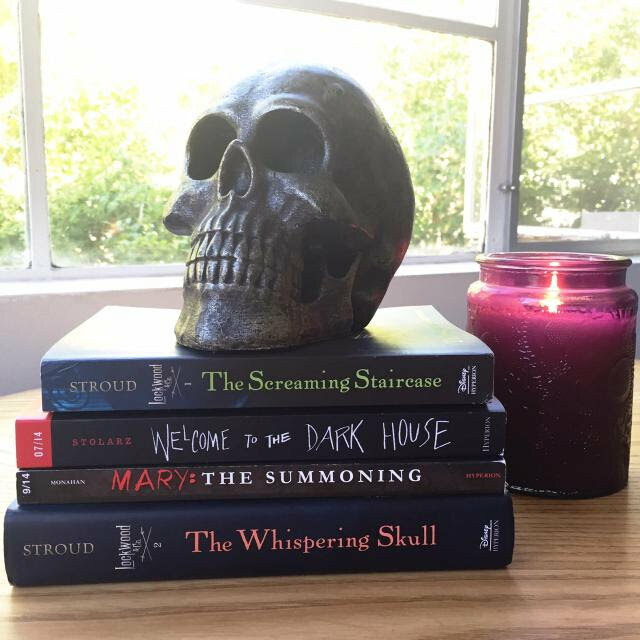 In addition to this guest post, you will have the opportunity to win a box of horror novels that you’ll get just in time for Halloween! Be sure to check out the full list of all the other stops on this thrilling tour for more chilling posts! 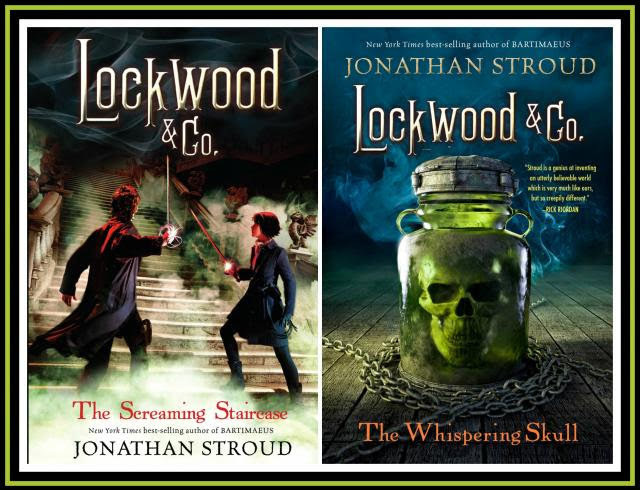 Jonathan is the author of the bestselling Bartimaeus Trilogy as well as Lockwood & Co. from Disney-Hyperion. Absolutely my favourite ghost film, an exquisite and near perfect adaptation of Henry James’ classic The Turn of the Screw. Deborah Kerr plays a young governess who comes to teach two adorable children in an idyllic country house. All seems set fair, but it isn’t long before she begins to suspect that Miles and Flora are being haunted by two recently dead servants, who have come back from the grave to corrupt them. Scripted by Truman Capote and John Mortimer, and featuring wonderful performances by the child actors and Kerr, it maintains the ambiguity of the literary original. Is the governess seeing wicked ghosts, or is she barking mad? Either way, it’s scary and unsettling. The original, not the dodgy remake. Another classy black-and-white adaptation of a literary classic, this time Shirley Jackson’s The Haunting of Hill House. A disparate group of psychic researchers arrive at a house of ill repute, and supernatural forces set to work. Soon one of them in particular, the vulnerable, repressed Eleanor, is being targeted. It can’t end well. Terrifically atmospheric and genuinely frightening. A classy portmanteau movie, with several ghostly tales told by guests at a party in a country house. Most famous is the final segment, with Michael Redgrave terrorised by a possessed ventriloquist’s dummy, but most of the other sections have been very influential. By turns comic (the golfing story), poignant (a Christmas encounter with the ghost of a murdered child), and eerie (the haunted mirror), it’s all tied together neatly by an excellent slingshot ending. Can I include this? Does it actually have any ghosts in it? There are demons, afrits, cases of Satanic possession… and various ghostly things turning up to menace the heroes as they cower in their protective pentacle at the finale, so… yes, I reckon it’s in. Hammer Studio’s best film, written by Richard Matheson, and with Christopher Lee and Charles Gray on the top of their form, it’s gloriously lurid and excellent fun. You have to ignore the first couple of minutes. In fact, best close your eyes for some of it, since the studio insisted on adding a redundant shot of the demon in question, when it would have been infinitely better to save it for the end. But the rest of Jacques Tourneur’s film is terrific, a spirited and atmospheric adaptation of M R James’s classic ‘Casting the Runes’. The kind of film (like several of these choices) that gives B-movies a good name. Hugely successful, the Japanese movie Ring spawned a plethora of movies featuring creepy girl ghosts with a lot of long dark hair. What I love about it is its fusion of classic folklore (it’s ultimately derived from an old Japanese tale about a servant girl thrown down a well), and modern urban legend. The idea of a cursed videotape that kills the viewer snaps this vengeful spectre instantly into the present day (though I guess you’d need to make it a cursed app now). It gives her immense potency. For a film with such a scary reputation, it’s also highly restrained, relying on slow-build of atmosphere rather than Grand Guignol effects. There’s nothing like ghost children to pack an emotional punch. In fact, I almost didn’t put this Spanish masterpiece in my list, because I personally find the outcome so distressing! But it’s a cracking ghost story, beautifully produced and filmed, and derives its power from the seamless meshing of old and new tragedies, the repercussions of past evil, and the remorselessly logical build-up of its supernatural elements. In all of this, it mirrors the very best classic literary ghost stories. Who couldn’t include this in a list of recent ghostly classics? Just occasionally a movie comes out where everything seems to work just right, and M Night Shyamalan’s debut is one of them. That ending aside, there are just so many brilliantly scary moments here, mainly involving the terrific Haley Joel Osment and what he sees when he’s alone at night. And Bruce Willis is fab too. A film that demands to be seen a second time, straight over, just so you can marvel how clever it is. What is it about Spanish directors and great ghost movies? This one, directed by Alejandro Amenábar, is up there with The Orphanage and Guillermo del Toro’s Devil’s Backbone as a modern classic. Consciously playing with themes familiar to us since The Turn of the Screw – big mansion, vulnerable kids, uptight isolated woman, oppressive forces homing in – it strikes all the right notes thanks to a pitch-perfect performance from Nicole Kidman. It’s also got the great Eric Sykes it as a sinister gardener, which is a bonus in anyone’s book. Friday, October 10 YA Romantics Quiz: What Dark House Character Are You? The box will be delivered just in time for spooky Halloween reading! Open to US and Canadian residents, see complete rules on entry form. I can’believe I haven’t seen any of those old films, but I have seen almost all Stroud’s more current picks. The Ring gave me the creeps. I would have to say Paranormal Activity is the one that gave me the heebie jeebies. Heidi recently posted…Something Wicked Strikes Day #8: Ellie Jordan, Ghost Trapper: Guest Post, Review and Giveaway! Celine recently posted…Do You Read Misbehaving Authors? I’m not really a big fan of horror movies. I will say that I did like The Sixth Sense, but The Orphanage was too creepy. Ghost stories are one of my favorite genres (subgenres?). I definitely think these movies would be suitable for Halloween, especially on a dark and cloudy night. I have seen every one of the modern ghost stories, and loved them, but I have not seen a single one of the classics and I really want to. There is something about those old classic films that just isn’t able to be reproduced these days. Between the old technology and the very low budget they have to rely on an actually great script and terrific acting to elicit emotions and fear from viewers. Too many new movies use in your face, over the top techniques and they just lose their ability to manufacture anything more than an eyeroll after a few.